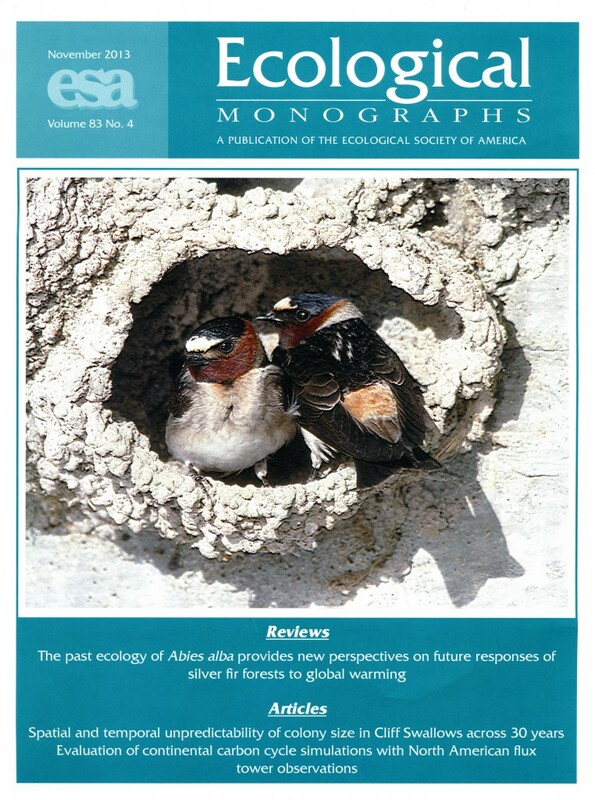 On the cover: Cliff Swallows (Petrochelidon pyrrhonota) at a colony in western Nebraska, USA. Swallow colonies exhibit temporal and spatial unpredictability in size, with one such as this hosting over 2000 active nests in some years and unused by any birds in other years. Over a 30-year period, annual colony size distributions were relatively stable and suggest that variation in colony size in maintained in part by fluctuating selection on group size. Charles R. Brown, Mary Bomberger Brown and Erin A. Roche. Nov. 2013. Spatial and temporal unpredictability of colony size in Cliff Swallows across 30 years. Ecological Monographs 83(4), pp. 511-530.